comments: his cousin Tito Guizar recorded a version the same year (Victor 32858). José Guízar Morfín, better known as Pepe Guízar, was born on 12 February, 1912, in Guadalajara, Mexico. He moved to Mexico City in 1928 and studied music at the National Conservatory. One of his professors, Erasmo Castellanos Quinto, instilled in him a love of poetry. Combining music and poetry, Guízar became known as "El pintor musical de México" (the musical artist of Mexico), with his numerous compositions that painted with music the geography of that country. He took folk-inspired music out of the bars and had it compete with the boleros and tangos. Pepe Guízar wrote "Guadalajara" in 1938 and then went on to perform it in the film "Caminos de Ayer" (also called "La Mano de Dios"). 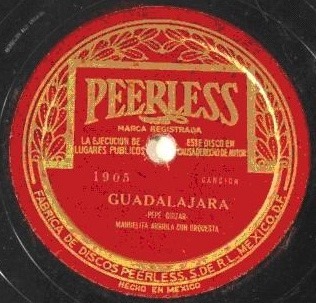 His recording was released in Mexico on the Peerless label, number 1905. Other notable compositions by Pepe Guízar include "Corrido del Norte," Tehuantepec" and "Como México No Hay Dos." Pepe Guízar died on 27 September 1980.